Brittany Patten excitedly joined the ImagineX sales team in June 2017. After graduating from George Mason University in 2012, Brittany jumped headfirst into a Business Operations role for a small federal BD firm in Ashburn, VA. With a solid understanding of federal contracting and a hunger for growth, she transitioned into an Account Management role with Kforce Federal, responsible for helping a number of large integrators fill critical IT roles and forming winning teaming and partnership agreements. 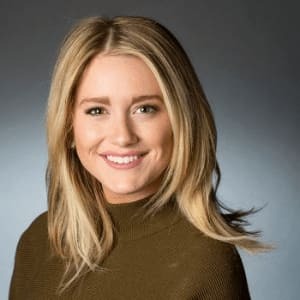 In 2015, Brittany made the switch from federal to commercial, joining the sales team at small consulting firm, and filling the funnel with a variety of fortune 500 clients. Her passion for the hunting and farming associated with finding new business and growing existing relationships eventually led her to seek a new & challenging role with ImagineX. Brittany is responsible for the oversight and management of all Business Development & Marketing activities for our team. Brittany spends her time (outside of chasing down leads) organizing, exercising and basking in the sunshine. A newlywed, she lives in Ashburn, VA with her husband Jake, and their German Shepherd, Stella. They are welcoming their first child in September! How can women better enable each other instead of competing? What needs to change in your opinion? This is a question that’s been weighing heavy on my mind for some time now. I think we need to accept that envy is a very natural part of life. I am envious of so many people for so many different things… may they be tangible items, personality traits, career successes, physical appearance, you name it. What needs to change? We need to make a conscious effort to accept that we can’t be the best at everything, but we are still valuable. Instead of trying to dull someone else’s sparkle, add yours to theirs and shine even brighter. What advice would you give to young women who want to join the Technology and Consulting workforce? My advice would be to go to school for Computer Science or Cyber Security. Having worked in both private & public sector consulting…this IS the future of technology jobs. According to the Bureau of Labor Statistics, the rate of growth for jobs in information security is projected at 37% from 2012–2022. Also, while you’re in college, GO TO CLASS. What advice would you give women struggling in a male dominated industry? Do your best. No one can ever make you feel inadequate if you have truly done the best you can. Have your own career goals and find a company, or start your own, that falls in line with helping you to achieve them. Male or female, the choice to struggle or succeed is a personal one. What advice would you give your 20-year-old self? Don’t try to figure it all out…you never will, so why waste time on worry?